ADHD: Causes and Possible Solutions was the title of the conference held on November 4-7, 1999 at the Key Bridge Marriott Hotel, Arlington, Virginia. Program participants presented a balanced view of conventional and non-conventional approaches to the diagnosis and treatment of ADHD and related developmental disorders of the central nervous system. The role of genetic, nutritional, food allergy and environmental factors in the pathogenesis of these disorders were discussed by nationally and internationally known authorities. Audience participation was an integral part of the program. The conference was sponsored by the Georgetown University Medical Center, Office of Continuing Professional Education, Washington, DC, and co-sponsored by the International Center for Interdisciplinary Studies of Immunology (Georgetown University Medical Center, Washington, DC) and the International Health Foundation (Jackson, Tennessee). "This conference is important because it brings together health care providers, researchers, educators and parents...Out of these discussions will come a set of recommendations important in the total management of ADHD. All of this information is important because parents need to be able to make treatment choices for their children based on the most current information." Click Here for Dr. Crook's presentation at the ADHD conference. According to this article the INCB is the latest group to charge that ADHD is overdiagnosed and methylphenidate (Ritalin) is overprescribed. And Ambassador Herbert Okun (US representative to INCB) said, "
there is 10 times as much usage in the U.S. as in the rest of the world." In replying to these charges the article cited the comments of three "medical experts" who supported the increasing use of Ritalin in the U.S. as compared to other countries. One of these experts, Mel Levine, M.D., F.A.A.P., said that INCB "
should be even more worried that other countries are not prescribing morethat they're not taking advantage of this treatment and are writing off children who are not succeeding in life." The article also cited a study published in the November 1995 Archives of Pediatric and Adolescent Medicine. Obtaining responses from 380 pediatricians in a random sample, researchers reported that pediatricians noted a number of common but inaccurate beliefs." Included among these was a statement that parents' observations that poor diet causes ADHD was a "misperception." *AAP News, Vol. 12 No. 5. Used with permission. "The incidence of ADHD has increased sharply during the last 40 years. Based on my own experience in practice, I'm certain that this is an actual increase and not due to increased recognition. "I urge the AAP Committee on Children with Disabilities and other appropriate AAP committees to host a 'workshop/think tank' on ADHD, its causes and management. Participants should include pediatricians and other professionals and non-professionals with different experiences and persuasions. The lives of countless children and their families are at stake." Millions of American children are troubled by attention deficit and hyperactivity and their number is increasing each year. 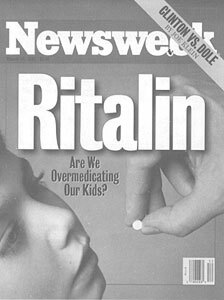 Ritalin and related medications help control the symptoms in some 70% of these children but often do not provide long term benefits. Children whose treatment program includes only medication, educational and psychological therapy continue to be at high risk for vandalism, petty crime, frequency of alcoholic intoxication and possession of marijuana. Repeated antibiotics for ear (and other infections) in infants and young children play a major role in causing nervous system disorders in many children. Here is a chart which summarizes the antibiotic/yeast/food allergy/toxin/ADHD relationship. Further scientific studies and clinical observations are urgently needed. The time to begin is NOW! Control the multiplication of Candida albicans in the gut. Lessen the production of toxins. Lessen the absorption of toxins and food allergens. Provide information that could help countless children. Has your child experienced problems sitting still and/or paying attention in school? Has he/she been diagnosed as ADD or ADHD? Have you or your physician considered giving him Ritalin and/or other psychotherapeutic drugs? 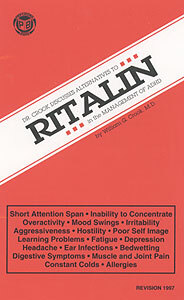 If your answer is 'yes' to many of these questions, you'll be interested in the recently revised and updated printing of my 32-page booklet, Dr. Crook Discusses Alternatives to RITALIN in the Management of ADHD. To obtain this booklet, send $5 to Professional Books, Attention: Brenda, P.O. Box 3246RB, Jackson, TN 38303. (Send a mailing label or self-addressed envelope. )The booklet will be mailed to you promptly. If you're not pleased with the booklet, your money will be returned.